'You might never play rugby again.' Everything that I had done for the largest part of my life had been centred around rugby, so you can imagine the shock I experienced on hearing that. But if you thought that was bad - there's more. The doctor went on to say that I could even die. That was the truly devastating part! From being on cloud nine - selected for the Springbok squad to go to the World Cup - I had been hit with shattering news that was more than enough to knock the wind out of my sails. I couldn't believe it - just when my career was beginning to soar. Being a top scorer in the winning Super 14 team, giving great performances in the Tri Nations and against England at Loftus, getting selected into the Springbok squad for the World Cup - and now this? These are the words of Pierre Spies, capped as a Springbok aged 21 only to be told a year later that he may never play rugby again. In More than Rugby, Spies, one of the most imposing and explosive loose forwards that South Africa has ever produced, shares his own story for the first time: his family life, his numerous sporting triumphs, and his faith. Much more than a sports biography, this is the moving, personal story behind the well-loved 'No. 8' of South African rugby. 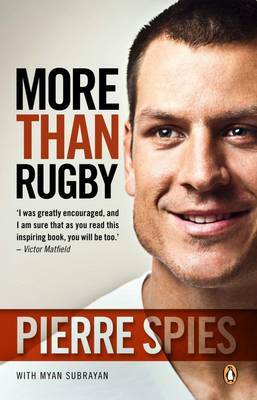 With a Foreword by Victor Matfield and contributions from Morne Steyn, Bryan Habana and Juan Smith.